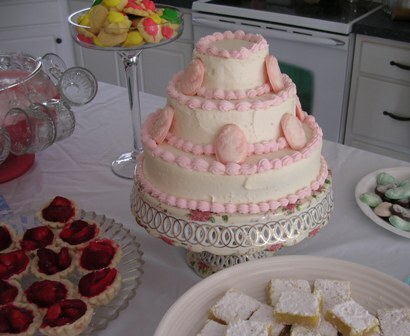 I mentioned earlier that I was going to be helping out with a wedding shower. The bride has a fun, modern style and I wanted to capture that feeling for her party. We were dealing with a tiny decoration budget($50), so I wanted the most impact for the least amount of money. There was a cherry blossom theme in the back of my mind, but I wanted to be careful not too have anything too kitschy. While searching for inspiration I came across a vintage 1907 postcard from Japan at the flea market. From this postcard I drew my color inspiration of scarlet red, pale pink and clear aqua. With temperatures hovering around the 80's, this was supposed to be an outdoor party on a pergola covered deck. It dropped to a chilly 60 degrees that day, so we had to reluctantly move the party indoors. 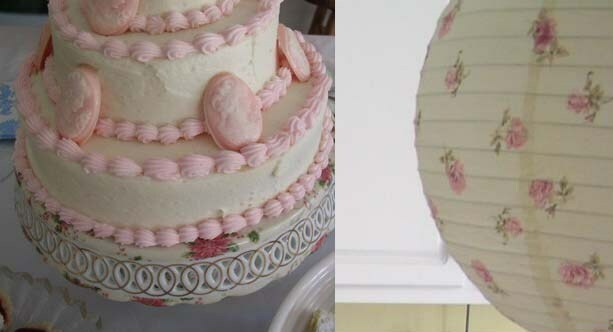 This posed a problem as large pink lanterns were part of the decoration. Twelve of them were supposed to be swaying in the breeze tied from the pergola. Instead, we were now working with a small space with a ceiling fan and nowhere to hang the lanterns. We decided to group them together and attempt to hang them from the fan. This did not prove to be an easy task, and we were working on it up until the bride to be walked through the door. So unfortunately, I don't have any final shots with everything settled and food on the table, but I did take some detail shots as we worked. I knew I wanted to have some type of Japanese cherry blossoms branch to decorate the food table. I wanted the blossoms to be thick, like the Fuzengo variety, but the way I was doing it was taking forever. I decided to twist the paper instead of cutting individual flowers, which probably looks more like a rose, but it was close enough to the effect I wanted. I then just affixed the blossoms to a branch I found in the woods. The tablecloth is actually a king sized bed sheet! I searched seven different stores trying to find an aqua one and came up empty. I happened to walk down the bedding aisle and the sheet caught my eye. When I'm determined to have something I will keep trying make it work. Though the biggest lesson I learned was to bring my own steamer to iron out wrinkles. For the paper products I decided to go with a complete monochromatic look to keep the clean, modern feel going. I was set on having square plates for the party and finally found the perfect shade of red. I went over the budget by $10, but I had fun sourcing this event. I tend to want to decorate with lots of vintage, so it was a change for me to go the other way. The wedding dress is certainly one of the most important elements (at least for the bride) of the entire occasion. I am inspired by all time periods in the past - I even think that the 80s had something to offer. One of my main inspirations has been late 19th century dresses. I love the gown & veil Gwyneth Paltrow wore in the 1996 adaptation of Jane Austen's Emma. Buying a vintage dress or wearing an heirloom inherited from another woman in your family is definitely a greener alternative to the retail purchase that most women pursue. You have to think; as soon as one of those typical purchases are made, another order is being processed for the same dress. Consider the energy you could save by recycling or purchasing a vintage dress! Short wedding dresses do not always mean casual, as evident by the middle dress. The dress on the right would look so sweet for a vintage beach wedding. I love this shot of musical stars Madge Elliott and Cyril Ritchard. I wish I could have talked Mr. M in to wearing this kind of tux. I don't think he knows how far ahead he would have been of the current top hat trend. When I started planning my own walk down the aisle this is one of the weddings that ended up in my inspiration binder. I fell in love with the the setting, an old stone hacienda built in the 16th century with blooming gardens. I loved it so that I even searched for a similar backdrop in my fiance's hometown to no avail(I'm not bitter though. Promise. Pinky swear. Okay. Okay maybe a little). Finding the perfect reception/ceremony spot can solve most of your wedding problems. There wasn't really much Dylan and Michelle had to do to their combined wedding/reception site, except add some romantic lighting and simple white covers for the chairs and tables. I absolutely love Michelle's something blue necklace, which added such a unique and personal note to her wedding dress. I love this image of a beautifully simple wedding in a rustic setting from J.Crew. It reminds me of my reception, which was held in a building constructed from 200yr old log cabins. I wanted to thank Kathryn of Snippet and Ink for including my bridal shower invitations in her beautiful moodboard. Snippet and Ink is a lovely site for all of you brides to get inspiration and to see real brides bringing their dreams to life. 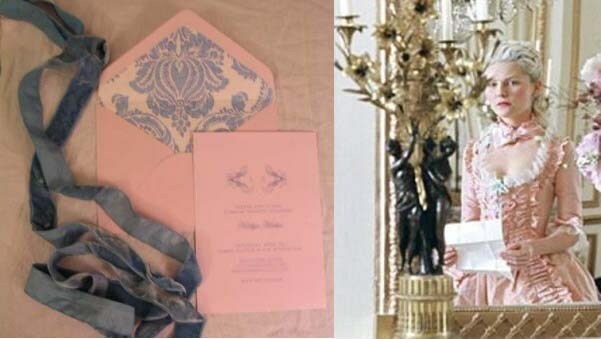 I loved Mary McDonald's invitations for a baby shower that were featured on Style Court. 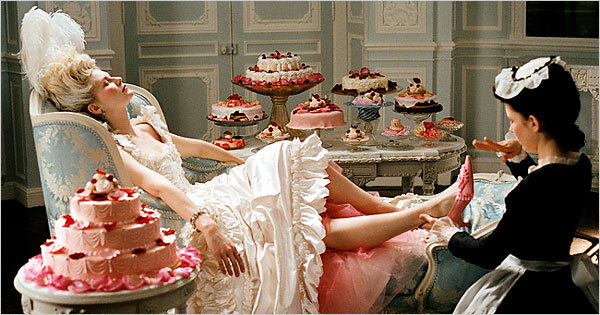 I used this photo as inspiration when trying to come up with invitations for my Marie Antoinette theme bridal shower. I couldn't find anything ready made that I liked so I decided to make my own. I found the perfect pink card stock at Target. They carry limited colors in the store, but it is a nice weight and a great price if you can find what you want. They even include a how-to template online to make invitations. For the top of the invites I used a free scrolly design from Dafont and then printed them out using our computer. 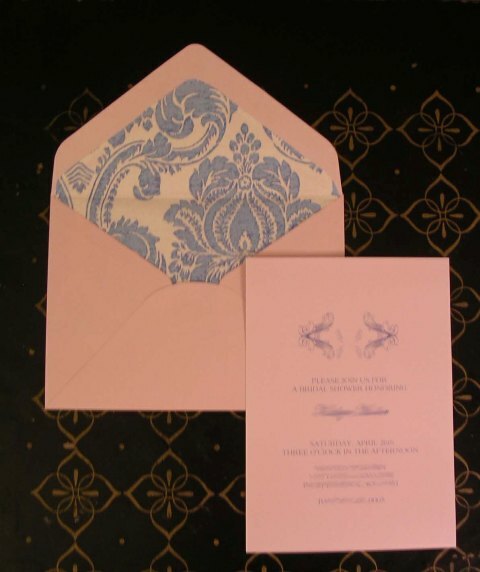 Finding a damask liner for the envelopes was much harder and almost my undoing. Once I get a specific idea in my mind there is no changing it and I won't settle for less. So I hunted for several weeks at any place you can think of from fancy online stationery shops to the Dollar Store. Mary McDonald used a photocopy of a print she loved to line her envelopes but I couldn't find anything that would fit. One day I popped into Home Goods and while checking the wrapping paper section I noticed a pack of damask party napkins made in Germany. They were the exact shade of blue I wanted and the paper had a pearly sheen. I thought, could these possibly work? I had googled how to line envelopes so I had a template ready. I then had the painstaking job of separating the fragile layers of the napkins and cutting each piece out. I used a glue stick to hold the liners in place and just a ruler to create a crease where the envelope shut. I also sealed each envelope with gold wax and my initial for extra oomph. I won't be doing that step again. I was very happy at how they turned out and they cost the same as buying them ready made in the store. I've gotten several emails lately about the Vera Wang sample sale I blogged about last year. Unfortunately I don't know when the next date will be, but here is some info that may help. Vera Wang used to list it under events dates on her website but ever since the site was revamped they have left that section off. When I googled an old archived page came up with this number listed for event info, it may still work 1-800-VEW-VERA. Also try calling the New Yorker hotel. That is where it was last year and if she has it there again they should know the dates. While I like the vintage vibe Leah Wood was going for, I'm not sure about the dress. I think it reminds me too much of a picture of one of my aunts in the late 60's early 70's with this almost exact outfit & hair do. Most of us know going in as a bridesmaid that the dress will be headed to the nearest Goodwill right afterward. But even with that knowledge, I'm just not sure what she was thinking with these dresses. The guests came ready for the cameras though. I think Patti Hansen looked amazing, I would love to have that dress. Kate Moss showed up 10 minutes late for the wedding. She picked beautiful accessories, shoulder grazing earrings, sparkling bag and an exquisite vintage midnight blue shawl. I'm on my honeymoon but will report back next week with pictures and tales to tell. Have a blissful day! 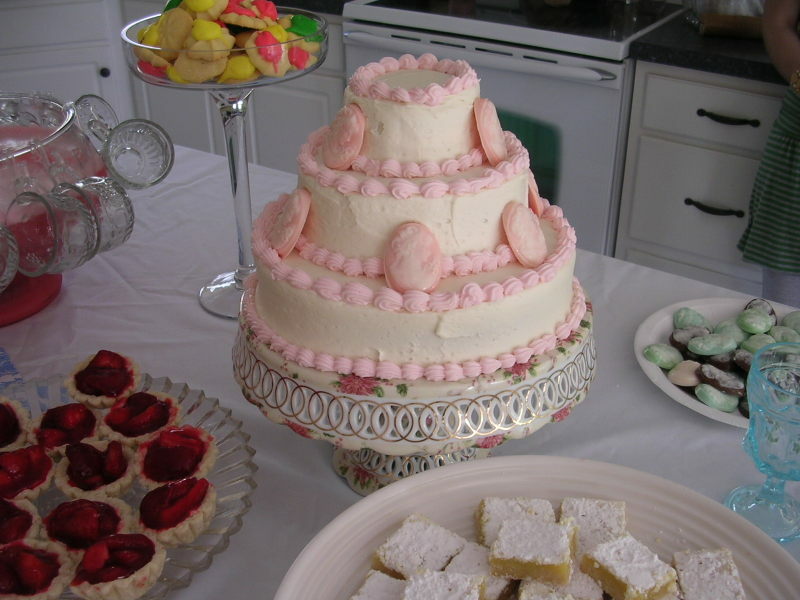 I had my wedding shower this weekend, can y0u guess the theme? I work in an almost all male environment, and I don't know very many fashion inclined people in my new residence. 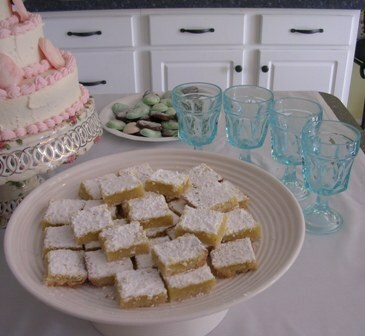 I wanted a day that was over the top, with tons of desserts and girl talk.